This week’s review is rather short. After spending all day Thursday and Friday travelling back to Canada, I arrived home to find that technical reasons prevented me from getting online until a few hours ago. My apologies. Publisher’s blurb: Dakota Taylor, the gay gunslinger, is back. Here, Dakota leaves his lover Bennie on the ranch for a short trip into town. But as he heads home, somebody tries to use him for target practice. Soon Dakota finds himself two hundred miles from Bennie, with no chance of returning until he finds out who wants him dead—and why. 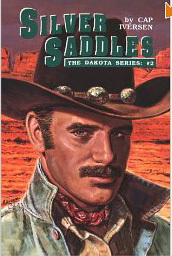 Having read Arson: The Dakota Series by Cap Iversen, and enjoyed it, I then went on to find (not that easily done) Silver Saddles [Alyson Books, 1993]. In this tale, gunslinger Dakota Taylor is now happily partnered with Benjamin Colsen, whom he met in the first of the series, and all is well until he get’s the news that his mother has passed away at the family’s homestead. After hearing this news in town he is ambushed on his way home, and discovers that someone has posted a bounty for him, dead or alive. When he recovers from his injuries, he sets out on a nine-month odyssey to find out why someone would hate him enough to go to all this effort to see him dead. To this point it is classic western fare, i.e. good guy v. bad guy(s), but then the author takes off on a flight of fancy that is both complex and incredible at times. It is the sort of thing that requires not only tight writing, but also tight control of the characters and events that are galloping all over the place. In this regard Iversen does quite well for the most part, and almost pulls it off…that is, almost. Fundamentally, the story suffers from too many characters doing too many things, as well as a plot that is too clever-by-half. Still, having said that, if you read it as being a “let’s pretend the West was like that,” it is a fun read and an evening’s entertainment. Three and one-half stars. A gay western in the Louis L’Amour tradition! Publisher’s blurb: People look up when Dakota Taylor rides into town. His legend precedes him and if that legend isn’t always founded in reality … well, Dakota’s not about to disappoint folks. Nor does he want to disappoint the handsome Bennie Colson, who has a job for him. Trouble is, Ben’s job means taking on a whole town of angry cattle ranchers. Pretty well everyone enjoys a cowboy story; especially if the principal characters get out of the sack long enough to ride a horse or chase a cow. Cap Iversen(?) has therefore struck an agreeable balance between the two types in “Arson! : The Dakota Series, No.1” [Alyson Books, 1st edition, 1992]. Dakota Taylor is a gunslinger—a ‘hired gun’—the fastest in the West. He has a pair of custom-made, silver-plated colts on his hip, and an instinct for calculated eradication of people’s enemies. He is juxtapositioned with Benjamin Colsen, a Harvard law student, who hires Taylor’s gun to avenge the Colsen family’s brutal murder—father, mother and siblings—on their mountain-top, sheep ranch by a group of unknown assailants. The issue seems to be a drying-up of the water supply that has mysteriously struck the valley, and the overall cast of suspects includes the cattle barren, James T Anderson, and practically everyone else in the dusty town of Turnpike. There are the usual supporting characters: A fat, incompetent and cowardly sheriff; a slick-talking merchant; a ‘meat-head’ butcher; and the weaselly manager of the local meat packing plant. However, there are a few that are slightly out of the loop, i.e. Ryder McCloud, another gunslinger, who has been hired by Anderson. McCloud and Taylor have had shootouts before, but these generally involved fleshy weapons between sheets. Nevertheless, with McCloud’s arrival the plot definitely thickens. Anderson’s young son, Seth, enters the picture as well. He is your typical brash, young Turk; enamoured with McCloud and not at all adverse to romping with Taylor. Meanwhile a sub-plot is developing, which involves a fabled Eternal Spring that only the Shoshone Indians and a few others—including Dakota Taylor—know about. Dakota is the adopted son of a Shoshone Shaman, and also becomes the confidante (and bed mate) of his warrior-like grandson; therefore, the only other(s) to know about it must also be the murderer(s). I will not go further for fear of spoiling the story; however, I will say that the writing style, told in a first-person narrative, is both colourful and appropriate. Moreover it has the air of authenticity, and it reads almost effortlessly. Whoever Cap Iversen is he or she is/was definitely not a novice writer or journalist. I do have some reservations regarding the number of gay characters that pop up quite ‘coincidentally’ in what is otherwise an insular and isolated community. There are, I believe, six such individuals, which is perhaps stretching the laws of chance and probability. In addition, the story seemed to lose its compactness toward the end. Nevertheless, this is a thoroughly enjoyable and well-crafted story, and I look forward to reading the other two, i.e. “Silver Saddles,” and “Rattler.” Recommended. “Cap Iversen seems to be a pseudonym. The best authority I have is that ‘she’ was a real estate agent in Texas. 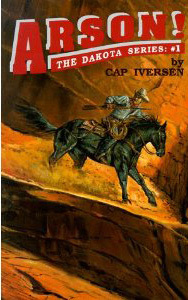 Albeit, Cap Iversen does not seem to have written anything before “The Dakota Series,” nor afterward. See a complete list of titles and authors reviewed. See a preview of Coming of Age on the Trail, read an excerpt. This is history, as told by Helena Huntington Smith, who says, “My part was to keep out of the way and not mess it up by being literary. 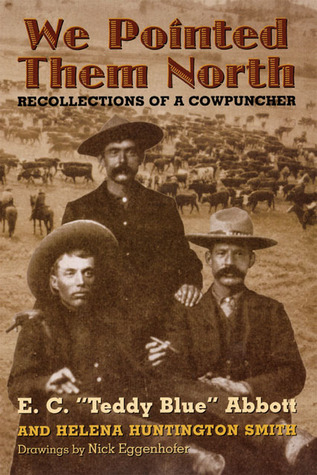 When I come across personal reminiscences of this nature (“We Pointed Them North: Recollections of a cowpuncher” by E.C. “Teddy Blue” Abbott and Helena Huntington Smith, drawings by Nick Eggenhofer, University of Oklahoma Press, 1955) I am immediately envious of my cousins south of the border because they have yet another window into their past. Unfortunately, apart from Norman Lee’s journal [see: Norman Lee “Klondike Cattle Drive,” Touchwood Editions, 2005] I am unaware of any other first-hand account(s) of Canadian history that is/are currently: a) published, and b) still in print. I would be happy if someone were to correct me on that statement, but alas I doubt it will happen. Therefore, with each generation that passes our Canadian pioneer experience becomes more and more obscure. Therefore, I have the greatest admiration for Abbott and his patriotic notion to leave a legacy behind for our appreciation. The other part was from growing up around the rugged Texans who came north with the very first cattle drives. As Abbott points out in clarifying the record, the cattle drives as we know them only lasted from about 1870-1886, and were almost completely gone by the 1890s. He also points out that the cowboy packin’ a gun on each hip was mostly a Hollywood embellishment. Nevertheless, Abbott carried a gun from the time he was fourteen, and even shot a man in a mêlée of drunken cowboys shooting out gas lamps. However, it was his contention that a gun was a necessary tool in frontier country. It enabled a man to protect himself against all manner of threats; to shoot food and signal if lost; and to avoid a robbery, etc. “The Olives were noted as a tough outfit—a gun outfit—which was one reason I wanted in with them. It would show I was tough as they were … They were violent and overbearing men, and it taken a hard man to work for them, and believe me they had several of those all the time. Men had to be tough considering the life they led. Abbott describes one situation where they were camped near a large prairie dog ‘town’ when a big storm came up that resulted in a stampede. In the morning it was discovered that one of the men was missing, and a search was made. That was not an untypical circumstance for a teenager in the 1870s. Imagine, if you will, asking today’s counterpart to give up the BMW for a horse, or his TV remote for an evening of chasing a stampede! Yet, for the most part—and almost entirely in Canada—the rugged contributions of these pioneers are all but forgotten. “So I got mad, too, and I says: ‘If I had little Billy [his horse] here’—well, I told her what I’d do to her piano. And John Bowen said: ‘Go and get him, Teddy, go get him.’ … I went across the street and got Billy … and rode him through the hall and into the parlor … And as soon as I got in the parlor, Maggie slammed the door … and called the police. 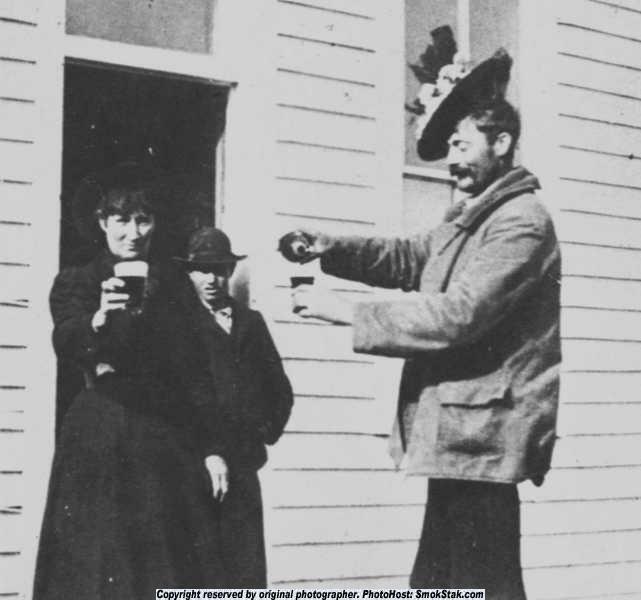 In his time Teddy Blue also socialized with some legendary characters synonymous with the Old West. These included Charles Russell—already mentioned—who ranks with Frederick Remington as one of the West’s most outstanding artists; “Wild Bill” Hickock, for whom Teddy Blue worked for a while; also Teddy Roosevelt, later President of the United States; and Martha “Calamity Jane” Canary-Burke. Perhaps not as well known was Granville Stuart whose DHS spread was one of the largest such operations in Montana. He was also known for leading a pack of vigilantes that brought swift justice to a number of cattle rustlers and horse thieves in that frontier country. Teddy Blue was a great admirer of Granville Stuart’s, and even more so of his pretty, young daughter Mary, whom Abbott married in 1889. Another side of Teddy Blue … A male lover, perhaps? “And there I claimed this young Indian, Pine … He was one of the best looking Indians I ever saw, six feet, one or two inches tall and as straight as a string. And he was brave—he fought for his knife—and I was sure stuck on him. Moreover, he casually relates that he and some of his girlfriends exchanged clothes and paraded around Miles City for a lark. Such an example can be seen in the above photo of him–wearing a woman’s bonnet–with Calamity Jane in the background. Considering that Teddy Blue was relating all this to Helena Huntington Smith in 1938-39, including the ‘Pine episode,’ it speaks volumes about this truly delightful character; one of the last of a kind, and for that reason I highly recommend it as a rollicking read and a slice of endangered history. Visit: Gerry B’s Books – News on current & future publications.